The author traces the 8,000 year history of the longbow as it has been recorded in historical documents and by archaeological discovery. The book is beautifully illustrated in colour and in black and white. It is lifted beyond historical account by the deep feeling the author has for his subject and his ability with words from his experience as an actor. DESCRIPTION: This is a reprint of a very popular book that was first published in 1976 by Patrick Stephens Limited in hardback. Since then it has been reprinted several time before Sutton Publishing was acquired by Haynes. That it has been reprinted so many times over several decades, proves its enduring popularity and a new generations of readers will now be served by a handsome softback edition from Haynes. The author, Robert Hardy is internationally known as an author and holds a strong interest in bows and other weapons, having served for 11 years as a Trustee of the Royal Armouries. 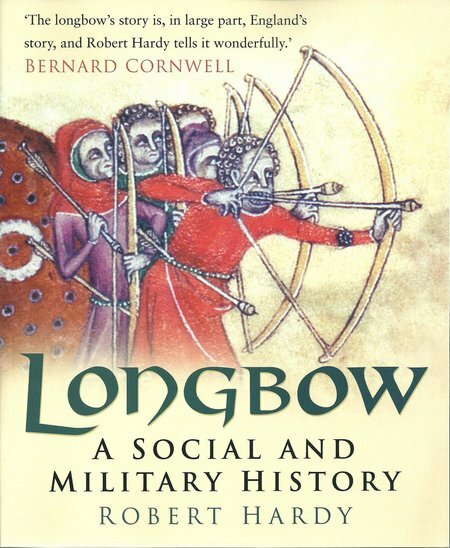 The longbow has been a particular interest and Hardy may reasonably claim to be THE international expert on its history and use. For many, the longbow is a Medieval weapon wielded by Welsh bowmen in the service of English Kings as the ultimate battle-winning weapon of its age. The bow and arrow traces back beyond history. No one can be certain when it was first used but it is probably contemporary with the spear and slingshot. Over the years it has been made from many different materials and in several sizes, from short bows used by ancient horsemen to the longbow that continued in first line military service after the production of the first effective firearms. Today, it continues in use alongside the cross bow for hunting and competition. The author traces the 8,000 year history of the longbow as it has been recorded in historical documents and by archaeological discovery. The book is beautifully illustrated in colour and in black and white. It is lifted beyond historical account by the deep feeling the author has for his subject and his ability with words from his experience as an actor. The longbow is not a simple piece of wood with a string attached, but a sophisticated weapons system with several different forms of construction and with a range of accessories that turn it into a formidable weapon. The author appears to have covered every conceivable aspect of the longbow and its employment. The reviewer has to say “appears” because only someone with an equal or greater knowledge of the subject could hope to identify any omissions. Hardy has covered the Medieval period and the use of the longbow in Europe, but he has not neglected its use in Japan, in North America before the arrival of Europeans, in around the world in history and in its continuing use in primitive societies today. It is very unlikely that the reader will think of a question that has not been answered in this engaging book which will undoubtedly continue in reprint after reprint. It is a highly commended work, produced in high quality and at a very affordable price.